Last week on Friday, during the Holy month of Ramadan, the so-called “Islamic” State killed dozens of innocent people in France, Kuwait and Tunisia. 3 Irish citizens were also killed in the Tunisia attack. 38 Muslims were killed in Kuwait by a suicide bomber affiliated with the so-called “Islamic” State. Indiscriminate slaughter, public beheadings and systematic starvation are all features of the murderous campaign by the so-called Islamic State. All these are absolutely against the teachings of Islam. Most victims of this murderous campaign are Muslims. It will be terribly wrong that in the face of the un-Islamic state atrocities if we as Muslims remain silent at how Islam is wrongfully defined as a barbaric religion by these terrorists. Muslims in Ireland marched against the caricatures of the Prophet Muhammad (SAW) in Dublin few years ago. The terrorists are damaging Islam and Muslims more than the caricatures and Islamophobia is increasing rapidly due to the atrocities of these terrorists. 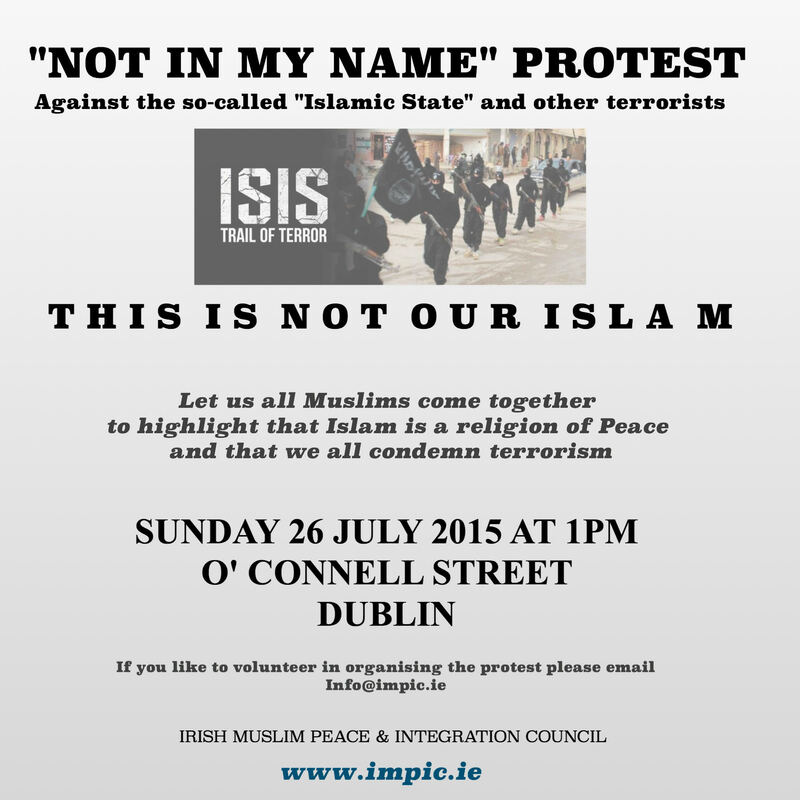 We invite all Muslims in Ireland to participate in “Not in our Name” protest on Sunday 26th July @1pm on O’Connell Street and demonstrate collectively that hatred and violence can never be legitimized in the name of Islam. With this protest we aim to highlight that Islam is a religion of Peace and show Ireland that all Muslims in Ireland condemn terrorism. May Almighty Allah unite us Muslims on Sunday 26th July 2015 in highlighting the true peaceful message of Islam, Ameen. Indeed, those who believe and do righteous deeds – for them are the Gardens of Pleasure.